Make the dough: Pulse the flour, granulated sugar, vinegar and salt in a food processor until combined. Add the butter and pulse until the mixture looks like coarse meal. Whisk the egg with 2 tablespoons water; add to the food processor and pulse until a dough just starts to form. Turn out onto a piece of plastic wrap; shape into a disk, wrap tightly and refrigerate until firm, 1 hour. Mist a baking sheet with cooking spray. Roll out the dough into a 12-inch round between 2 sheets of floured parchment paper. Remove the top piece of parchment and invert the dough onto the prepared baking sheet; remove the other piece of parchment. Refrigerate until ready to assemble. 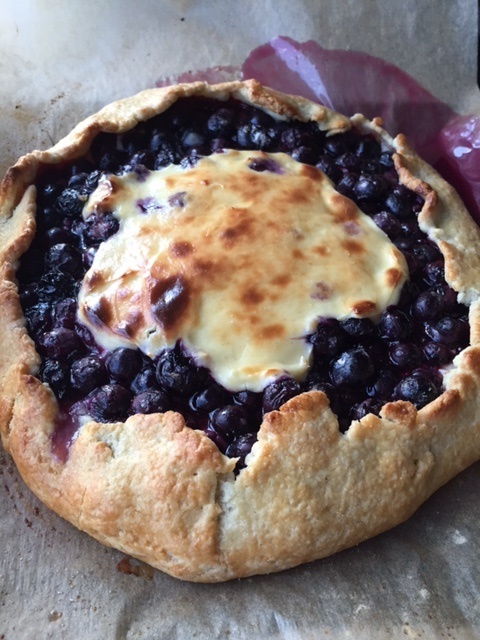 Make the filling: Toss the blueberries, 1/3 cup granulated sugar, the lemon juice, cornstarch and salt in a bowl. Whisk the cream cheese, egg yolk, the remaining 2 tablespoons granulated sugar and the nutmeg in a separate bowl. Spread half of the cream cheese mixture over the dough, leaving a 2-inch border. Top with the blueberries. Fold the edge of the dough over the filling. Gently pour the remaining cream cheese mixture over the berries; refrigerate 30 minutes. Preheat oven to 425 degrees F. Remove galette from refrigerator and brush the crust with the beaten egg and sprinkle with coarse sugar. Put the baking sheet with the galette directly in the oven. Bake until the crust is golden, 20 to 25 minutes. Let cool slightly before slicing.